Which is Best: High Back or Backless Booster Car Seats? This post is brought to you by BestCarSeatHub.com. When your child outgrows the harnessed car seat, it’s time for an upgrade. Boosters are essential safety devices that position the child so the seat belt fits them correctly. Between the ages of 4 to 8, studies show that they’ve reduced injuries from car crashes by 45% versus kids using only the seat belt. 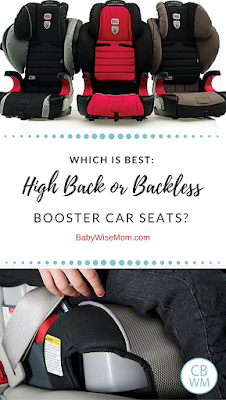 When your child is at least 4 and weighs 40 pounds or more, if she is too tall for her car seat (meaning shoulders higher than the tops of the harness straps), and if she can sit up properly for the whole trip, she may be ready for the booster upgrade. But, be sure to check SafeKids.org to find your local regulations. If your child is ready for an upgrade, now you must choose which one is best. Choosing from the myriad of booster seats on the market is challenging. Do you pick a simple backless model or a high back one? Let’s look at the pros and cons of each to help you make an informed decision. There are other important things to remember when buying a booster seat. Don’t add strap covers or other accessories if they don’t already come in the box or aren’t approved by the manufacturer. It could actually void your warranty if the need arises. Be sure to read your manual thoroughly and read it again every so often. It will help you remember height and weight requirements and other safety measures you might have forgotten. Also keep yourself updated on any product recalls so you’ll always be using a safe product. SaferCar.gov is a great place to look for recent recalls. Still unsure about which is the safest? 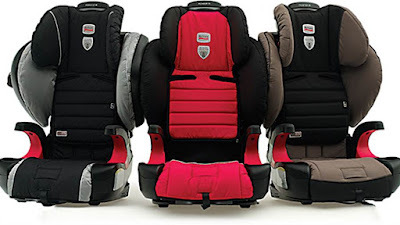 Check the American Academy of Pediatrics’ list of approved car seats. When the child moves, does the seat belt stay in place? Is the lap belt positioned low on the abdomen, near the top of your child’s thighs? Can the seat belt cross evenly over your child’s shoulder between the arm and neck? Is your child able to sit all the way back against the backseat without slumping? Can your child’s knees fully bend over the backseat’s edge? Can your child remain still and comfortable for the entire car ride? Again, be sure to read your manual to get age/weight guidelines, then verify with your local regulations and the AAP’s recommendations. Don’t forget to register your car seat in order to be notified if there is a recall.